Alzheimer’s has a great impact on the individual who suffers from it and their families, it is truly devastating to not remember your own kids, or your own name and eventually comes the need to be taken care of and watched 24 hours a day. There are no known cures for dementia, but, there are foods and lifestyle choices that can help to prevent it or lower the risks for it. Here are some foods that are known to improve mental function and lower the risk of dementia. Whole Grains – Good grains include gluten-free oats, Kamut, and quinoa (not cereal or bread). Leafy Greens – Kale, collard greens, spinach and mustard greens. These great foods are high in B9 and folate, which have been shown to reduce depression and improve mental cognition. Cruciferous Vegetables – Cauliflower, bok choy, kale, broccoli and Brussels sprouts have folate and contain carotenoids that reduce homo-cysteine. Homo-cysteine is an amino acid that is connected with cognitive impairment. Berries and Cherries – These wonder fruits contain anthocyanin, which is known to protect the brain from being damaged by free radicals. Beans and Legumes – they contain folate, potassium, magnesium and iron that help with neuron firing and body function. These foods also have choline in them. Choline is a B vitamin that can boost acetylcholine, which, is a neuro transmitter that is critical for normal brain function. 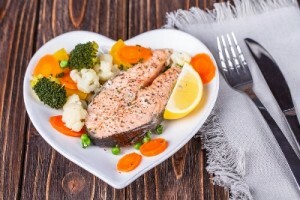 Omega 3’s – People who eat foods rich on omega-3 fatty acids have been shown to have a 26% less chance of developing brain lesions that can cause dementia. Fatty acids are good way to help the brain stay in optimal health. Some great sources for omega fatty acids are flax seed, olive oil (but not safflower), fish, especially, salmon or by taking a quality supplement. Seeds – Pumpkin and Sunflower – These are excellent sources of vitamins, choline and zinc. Spices – Sage, Cumin, Turmeric and Cinnamon – These spices are known to help break up brain plaque and it decreases inflammation of the brain, which are known factors that in memory loss. Nuts – Almonds, Walnuts, Peanuts, Cashews, Hazelnuts and Pecans – These nuts are important sources of omega 6s, omega 3s, folate, magnesium, vitamin E and B6, vital antioxidants that protect cells from damage and improve aging. Vegetables – Squash, Pumpkin, Tomatoes, Beets, Asparagus and Carrots – If eaten uncooked they contain folate, iron and vitamin A. These foods are good at increasing cognitive abilities. To decrease your risk of dementia even further it is recommended that you make the proper lifestyle choices that will avoid illness and diseases like heart disease, diabetes, hypertension and obesity. These health concerns are all linked. When our bodies come out of balance it causes a cascade effect that can have far reaching effects on our health. Exercise in conjunction with the proper diet is the best way to lower your risk of dementia. Food gives your body the building blocks it needs, and exercises keeps it in the best shape possible. There is no cure for dementia. The best we can do is limit the factors that cause dementia by leading a healthy life and taking care of our bodies. Exercise and the proper diet is the best way to do that.